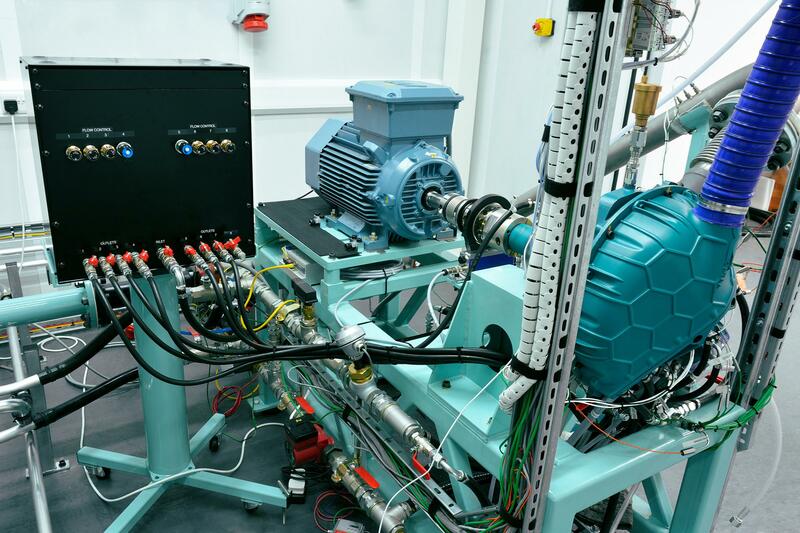 A UK-based engineering firm is using thermal imaging cameras from Micro-Epsilon to accurately measure the temperature profile of its revolutionary new air compressor, which is already attracting worldwide attention due to its energy saving capabilities. Based in Napton, Warwickshire, Lontra is an innovative engineering company that delivers revolutionary new air compressor designs, proven to provide real energy and cost savings to industry. The company derives its name from a genus of Otter, an intelligent, resourceful and playful animal that for many signifies clean water and a sustainable environment. Advanced testing facilities at Lontra enable the company to control and accurately measure the true performance of its products, namely the Blade Compressor®. This new form of air compressor (or vacuum pump) is the first widely applicable new compressor design in the industry for over 80 years. Founder and CEO of Lontra, Steve Lindsey, was recently shortlisted in the 2017 European Inventor Awards (run by the European Patent Office) and was the only UK finalist in these prestigious Awards. In 2015, when the initial Blade Compressor® prototypes were being developed, Carl Godden required some thermal imaging cameras to measure the external skin temperatures of the complete compressor, as well as its various sub-assemblies and individual components such as bearings. Clearances inside the compressor are very tight so it’s important to monitor the temperature profile of abradable coatings on some of the internal components during tests. Prior to purchasing two thermal imaging cameras from Micro-Epsilon in Spring 2015, Godden says that all surface temperature measurements on compressors and their various sub-assemblies were performed using stick-on thermocouples. At least 15 thermocouples were required to do this, with each thermocouple requiring its own separate measurement channel to record the temperatures at various locations on the compressor. “The other problem with this approach is that you obtain spot temperatures from the various thermocouple positions, but you don’t get an overall temperature profile or video snapshot of the complete compressor or surface area. In addition, we started to work on a more compact, higher pressure version of the Blade Compressor®. We needed to measure the temperature profile of this new design and monitor the temperature differences across various components and coatings so we started to look for a suitable thermal imaging camera,” explains Godden. After considering various suppliers, Godden selected the thermoIMAGER TIM 640, an infrared thermal imaging camera from Micro-Epsilon that is able to record radiometric video at an optical resolution of 640x480 pixels. With extremely compact dimensions of 45x56x90mm and a weight of just 320g, compared to other similar-size cameras, the thermoIMAGER TIM 640 is the only camera that enables the recording of radiometric video images at 32Hz and a VGA resolution of 640x480 pixels. With a thermal sensitivity of 75mK, the camera can detect very small temperature differences. At ambient temperatures of between 0 and 50°C, the camera can measure object temperatures ranging from -20°C to +900°C. By using thermal imaging cameras – in R&D, new product development and high volume production – hot spots and defects can be detected quickly and reliably, without influencing the target object. A USB 2.0 interface allows video recording at 32Hz. This is beneficial for short-term thermal measurement activities, which need to be analysed in slow motion playback. Individual snapshots can be taken from these recordings. Measurement points are freely selectable and can be analysed via user-defined areas of interest. Alarms can also be set up and displayed, as well as maximum, minimum and average temperatures. For easy process integration, the TIM 640 is supplied with the TIM Connect software as standard. This enables users to monitor and document measurements and to edit infrared video images. The software provides quick and easy set up together with a range of software tools that enable the cameras to be used in R&D tasks as well as process control. The TIM 640 is also supplied with an integral process interface for input and output of analogue and digital signals (alarms, temperature values, etc.). Open connectivity drivers are also provided for software integration via DLL, ComPort and LabVIEW, simplifying connectivity to fieldbus networks and automation systems.